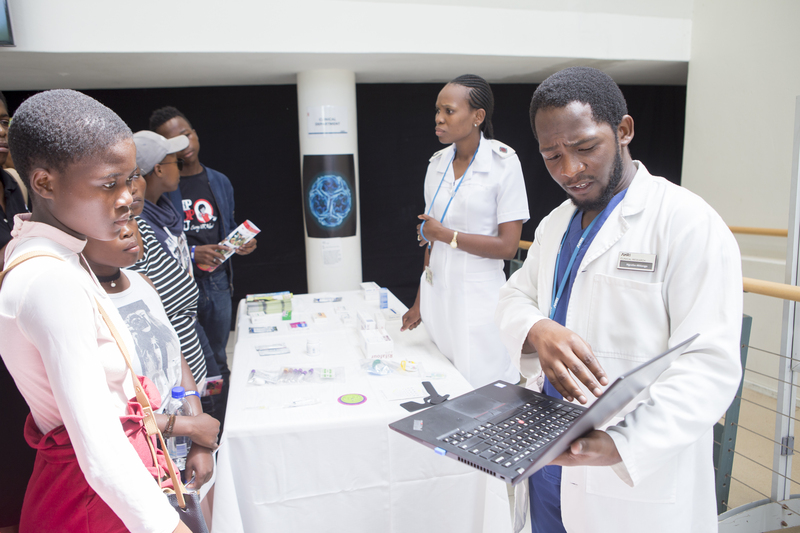 On Saturday 16 March, Africa Health Research Institute (AHRI) hosted a science fair and ‘Hip Hop Health’ music event at its Somkhele Research Campus. The event formed part of a research dissemination and public engagement project relating to five recent scientific studies, which were focussed on the health and health-related challenges children, adolescents and young adults living in uMkhanyakude district face. For the past three weeks, AHRI scientists worked with 30 learners from neighbouring high schools, together with a sound engineering crew and with expert input from public engagement specialists from Jive Media Africa, to develop the core findings of the research into five unique songs. The scientific studies had a common theme relating to the health of young people. This included a research project exploring young people’s vision of and hope for the future; the rate of TB infection among children and teenagers; how young people experience health services; young people’s experiences of moving from a rural to an urban environment – as well as a study on sexually transmitted and reproductive tract infections among young men and women. 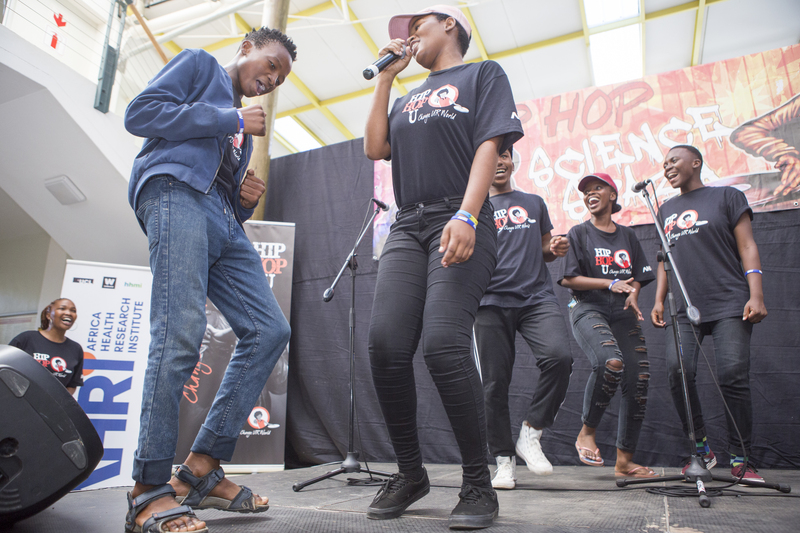 Through the ‘Hip Hop Health’ programme it is hoped that the learners gain knowledge and skills and start to become active agents for change in their communities. The process replicates the science research cycle, giving young people a sense of their own power in responding to challenges through research and dissemination of findings. On Saturday afternoon, the learners from Nkodibe Secondary School, Ikusasalethu Secondary School, Nomathiya Technical High School, Inkosi Mgwazeni Secondary School and Umfolozi High School performed the songs on stage at AHRI in front of their family, friends, teachers, AHRI staff and other young people. The songs were professionally recorded and will be broadcast on community radio stations. Above: The Living Legends on stage, performing their song ‘Hamba Uyachecka’, encouraging young people to make use of clinic services. Living Legends are comprised of: Minenhle Mthembu, Senamile Nzima, Anele Mkhabela, Khayelihle Mdluli, Nhlakanipho Mdluli and Sanele Mdletshe. 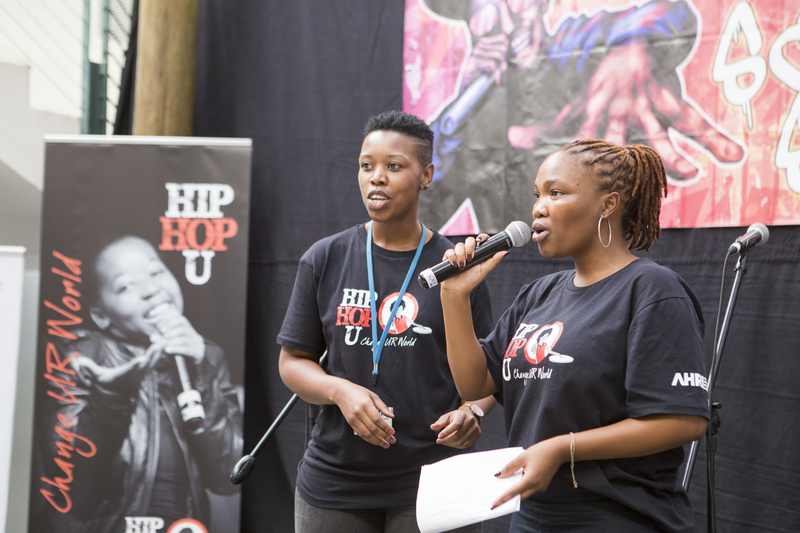 Above: AHRI Social Scientist Lerato Mchunu (left) with Hip Hop Health host Sthabile Mazubane on stage. On the day, AHRI also hosted a small ‘science fair’ for the visitors, which included discussions about the work that the institute does, video screenings, and a laboratory tour. 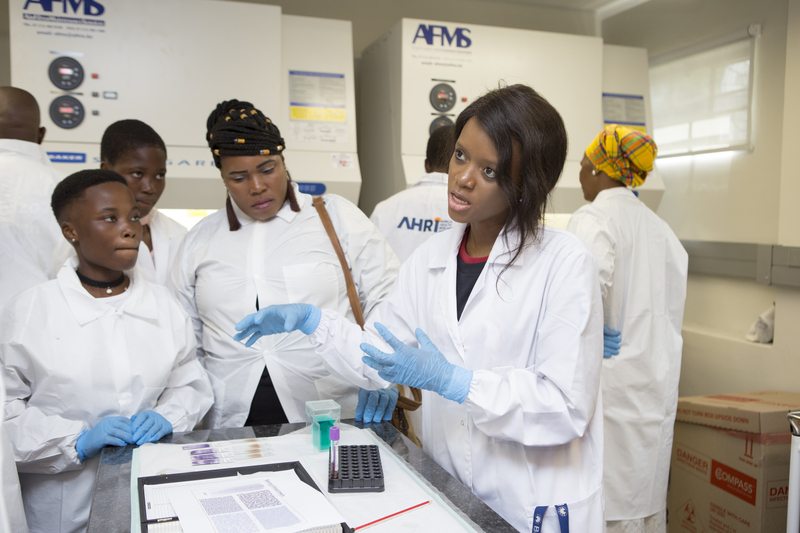 Above: AHRI Laboratory Supervisor Zizile Sikhosana demonstrating some of the work the lab does to visitors during the AHRI science fair. Above: Dr Ngcebo Mhlongo, a Research Medical Doctor at AHRI, with AHRI nurse Zandile Nkwanyana, describing their work to young people at the AHRI science fair. Above: AHRI study coordinator Vuyiswa Dlamini speaks with participants at the science fair. Saturday’s event was the start of a new and exciting partnership between AHRI and young people living in the institute’s research area. Problem identification – learners from five schools were given information about five studies that were done by AHRI researchers. These studies explored health issues that affect children, adolescents and young adults within their community. Research – learners undertook research tasks with help from AHRI researchers. Fact sheets were designed around these research studies and their outcomes, and learners worked in groups to interview researchers from each study. They used this information to develop the chorus for their songs. Advocacy – learners worked with experts and musicians to compose and perform songs about the health issues faced by young people in their communities. 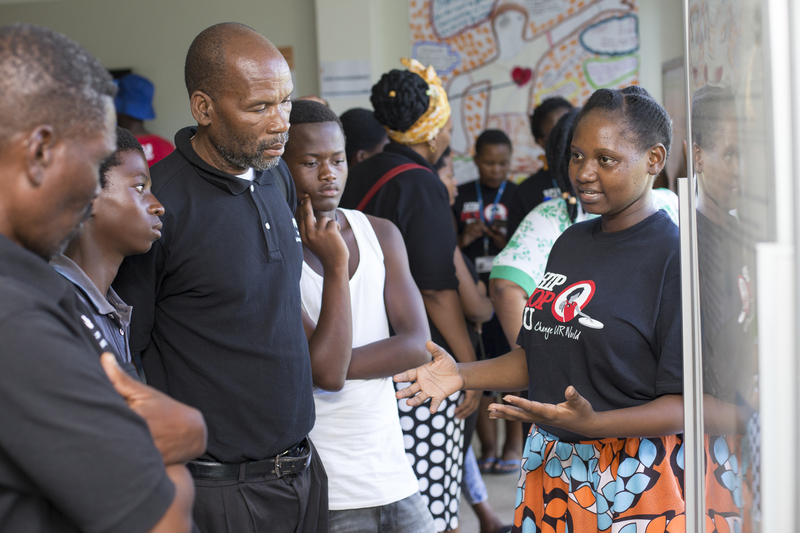 Saturday’s event was an opportunity for learners to present their knowledge and potential solutions to their guests and to the broader community. All the songs were recorded live and will be made available for widespread engagement around health-related issues. Top photo: The ‘Assemble Crew’ on stage at AHRI, made up of: Njabulo Msane (front), Sbonelo Mkhwanazi, Senamile Nsibandi, Bongumusa Mkhwanazi, Ntuthuko Mdladla and Spesihle Mgenge. The Assemble Crew wrote and performed a song called ‘Hope’, in which maskandi met hip hop.